China is attracting a massive influx of international students, but what are the policies in place to help them stick around? China's Ministry of Education held the first ever ministry sanctioned international students job fair in China at Peking University on April 18, attracting over 1,700 foreign students from nearly 100 countries, according to the Chinese Service Center for Scholarly Exchange (CSCSE), an organization under the Ministry of Education in charge of the job fair. 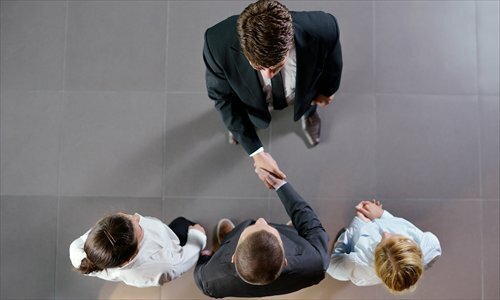 The event provided more than 300 positions from some 20 Chinese institutions and enterprises, including the Central Compilation and Translation Bureau, the China Railway International Group, Huawei and China Minsheng Bank, a press release from CSCSE said. 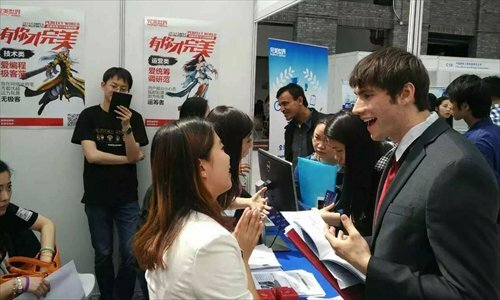 "There has long been a great demand among international students for professional vocational guidance and career counseling, and this first-of-its-kind job fair hosted by the authorities is a response to that demand," said Liu Guofu, a professor of immigration law at the Beijing Institute of Technology, and an invited senior researcher at the Center for China and Globalization. "This is a good move, but there is still more to be done." According to statistics released by the Ministry of Education in mid-April, there were 397,635 international students from 202 countries and regions around the world studying in China in 2015, a 5.46 percent increase over 2014. Though more and more international students are attracted to the Middle Kingdom, with China becoming the second biggest economy globally and being considered as a superpower which will drive the world, people still find it hard to pursue a life in China after graduation, largely due to a lack of career opportunities open to the expat community. Experts concede that while the central government is trying to encourage talented international students to stay and develop their career in China, there is still a lot to be done at the executive policy level. Eytan Tepper moved from Israel to Beijing in 2011 to pursue a PhD in international law at the China University of Political Science and Law. "I wanted to know more about China, how it is changing, and how China is changing the world. I wanted to get an inside look at what will be the future of the world," he recalled when asked why he chose China for higher education. "One of the major things that made me want to come to China after my first visit, and went with me all the way, is the incredible dynamism in Beijing and in China. Everything changes all the time, in every way you can think of. There are lots of activities in terms of culture and economy, and there is no dull moment." Tepper thinks studying in China is a great opportunity for foreign students to learn from within what China is and how Chinese people live and think. Arif Muhammad, 38, from Pakistan, is looking forward to graduating with a PhD from the Communication University of China in 2017. Majoring in development communication, he focuses on China's development, its impact on neighboring countries, Asia, and the world. Muhammad worked in the Pakistani media for seven years before moving to China in 2010, and then for Reuters and China Central Television (CCTV) respectively. He attributes his interest in China to years of experience in journalism and a close observation of the world. "I like China's struggle for development. It's unique and special; it's impressive and worthy to be known," he said. Muhammad now operates a website, nihao-salam.com, which mainly covers the China-Pakistan Economic Corridor, a major project of the One Belt, One Road initiative, and other news about the two countries. "Asia is emerging. And apparently China is driving Asia. One Belt, One Road is linking Asia's power to the rest of the world," said Muhammad, who thinks highly of China. According to the statistics released by the Ministry of Education, participant countries in the One Belt and One Road initiative are the main driving force behind the increasing number of international students studying in China. Muhammad said the website, although it is sponsored by the Pakistan-China Institute, is barely profitable. He and the 11 other Pakistanis that operate it get paid for their work. 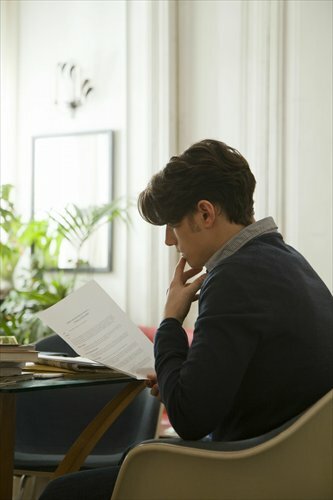 He is also a paid content provider for PandaGuidesOfficial, a WeChat account boasting 35,000 expat subscribers around China, which, according to him, is also "in the struggling phase and looking for investors to boost it further." He wants to stay in the country but is concerned about his future after graduation. "I have some innovative ideas for media projects, but I need to find partners to start," Muhammad said. He tried to start a business with Chinese partners, and even attended job fairs and applied for several media positions but got no call backs after the first round of interviews. "I have to face discrimination just because of my skin color and passport of Pakistan," he complained, "White skin sells like gold in China." But according to Professor Liu, while it might be true that Caucasians can get a job in China more easily than other people, this is due to a preference for people from developed countries, not skin color. He thinks the fundamental obstacle to international students seeking employment in China is their status as new entrants into the job market, not skin color or nationality. Jeff Frey, the cofounder of InternInBeijing.com, an online platform that provides intern and job opportunities for international young professionals in Beijing, holds the same view. "At the moment, it is almost impossible to get a job directly after graduation," said Frey, who is Swiss. "It's hard to get a work visa just after graduation because you need two years' work experience to get it." He explained that to avoid this catch-22 trap, one needs to work for at least two years before arriving in China to pursue a degree. Frey thinks if the visa policy gets relaxed, a great many international students will opt to stay in China to work. "Many see a lot of potential in China's growing economy," he said. "And people are especially interested in working with startups, which is now encouraged in this country." For Frey, this fact is a good enough reason for the Chinese authorities to raise the bar for foreigners. "They have to protect the market and give Chinese students the chance to find good jobs after graduation first." Despite the roadblocks, Frey thinks things are getting better for international students, albeit very slowly, and sees the series of new policies being released as an indication that the government is encouraging international students to stay. According to Liu, there are two policies that were released in Beijing recently that are favorable to international students. One of them states that if a student graduates with a master's degree in China, they are exempt from the two-year work experience requirement to get a work visa. This was also verified by Frey, who takes it as a positive signal for more policy adjustments in the future. The second change for Liu, is a policy released by the Ministry of Public Security, and published in a Xinhua News Agency report on February 25, which states that as of March 1, international students at universities in Beijing can start a business as a part-time activity, so long as they get consent from their universities and have their residence permits adjusted to identify them as a part of a "startup." According to Liu, while the recent favorable policies coincide with the government's strategy for attracting international students in the latest Five-Year Plan, the move barely satisfies the needs of international students and the employment market, and there's a huge space for improvement at the executive level. "The government officials at the executive level are still too conservative about loosening policy. They should be more open to changes," he said. "First, international students are far from being a threat to local talent. There are only around 4,000 foreign graduates with a bachelor's degree every year in Beijing, while the number of international enterprises and organizations in Beijing is over 20,000, not to mention that some Chinese enterprises also need foreign talent." Liu said that international students in China and the Chinese employment market have a mutual demand for each other, so authorities should open work visas to all foreign graduates with a degree, so that potential employers and employees can have easier access to each other. Study Abroad - What Students Should Know! Study Abroad - What Parents Should Know!